Before purchasing wireless headsets you need to understand the significant differences between the Wireless and Bluetooth families. Wireless headsets (also known as DECT headsets) are often confused with Bluetooth telephony headsets as they both give you the freedom to move around the office while talking on the telephone. You are no longer tethered to your desk. They are both described as "wireless" or "cordless", which is even more confusing. They both "talk" to base cradles. The first difference to consider is RANGE. A Wireless headset has a range of 100 metres (300 feet). However, a Bluetooth headset only has an official range of 10 metres (30 feet). In an office environment this can be as low as 5 metres. So, if you need to move a reasonable distance from your desk you need to have a Wireless headset. These distances are influenced by your office environment - your walls (and what they are made out of) may reduce the actual range that you can achieve, open areas (i.e. line of sight) may actually help you get further than the official figures. The next major difference is CONNECTIVITY. A Wireless model headset can only connect to its telephone base cradle - although in some makes multiple headsets can simultaneously connect to the same base. A Bluetooth headset can connect with up to 7 different devices (including its telephony base cradle of course). Contention can also be an issue. If you have more than 7 bluetooth headsets operating in the same room then contention will occur. This means that a number of the bluetooth headsets will hear an annoying click click click in their ears until the number of headsets operating in that area reduces to 7 or less. The clicking is caused by the headsets competing for the 64 channels available with bluetooth technology as each headset requires 8 channels to work. Contention is rarely an issue with DECT wireless technology as up to 120 headsets can operate in the same zone before any issues arise. All major headset manufacturers now offer DECT 6.0 Wireless technology. 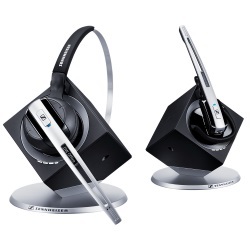 Plantronics has the Savi series (W710, W720, W740), and the CS Series (CS510, CS520, CS540). Sennheiser has the D 10, DW Office, DW Pro1 & DW Pro2. All wireless headsets have an mechanical optional handset lifter. Most even have Electronic Hook Switch (EHS) cables for some phones. Both of these enable you to answer telephone calls while you are away from your desk. The mechanical lifter works by being fitted on your telephone, underneath the handset (EHS cables are simply plugged into the telephone). When your phone rings your headset beeps in your ear. Simply pressing a button on your headset causes the handset lifter to rise (or switch hook to activate in the case of the EHS), lifting the handset, and you can converse with the caller. You press the button at the end of the call and the handset lifter lowers the handset back onto the telephone (or de-activates the hook switch in the case of the EHS) hanging up the call . These lifters are the same as that used by the Bluetooth headset of the same brand. Thus, they can be re-used if you happen to change cordless headset types - but keep the same brand. The latest models of telephony Wireless headsets are very reliable - the earlier versions had problems but don't let that worry you, they have all now been rectified. The most frequent problem that occurs now is "loss of pairing". This happens when the top stops talking to the base cradle. From our experience, this only happens infrequently (mainly when the base cradle loses power while the headset is not in it's cradle). But, when it does, you lose all use of your headset - this is very disconcerting. DONT PANIC. The fix is very easy. You simply ensure that the headset is charged and undertake a process that re-establishes the pairing (i.e. connectivity).